The Rivanna Stormwater Education Partnership is a collaborative effort among the local entities that hold stormwater permits under the National Pollutant Discharge Elimination System (NPDES) Program. These permits relate to the operation of municipal storm sewer systems and require the permit holders to achieve numerous goals related to education, outreach and public participation in stormwater management. Regulatory authority for the program falls under the Virginia State Water Control Board under the oversight of the Virginia Department of Environmental Quality. The permit holders that comprise the Partnership are Albemarle County, Albemarle County Public Schools, the City of Charlottesville, the Rivanna Water and Sewer Authority, and the University of Virginia. The Thomas Jefferson Soil and Water Conservation District provides support to the Partnership and serves as its coordinating body. The Thomas Jefferson SWCD also serves as the contractor that implements several of Albemarle County's permit requirements. The District developed and maintains this web site. The Rivanna River Watershed is located in Central Virginia in the eastern foothills of the Blue Ridge Mountains. 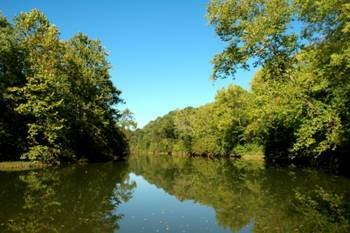 The Rivanna River is a tributary of the James River and is in the Chesapeake Bay Watershed. The Rivanna River Watershed drains approximately 766 square miles and is home to many historical features such as Monticello, the home of Thomas Jefferson, our third president, and Ash Lawn Highlands, the home of James Monroe, our fifth president.